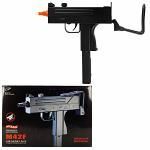 The Crosman Elite Commando Airsoft Kit 6mm Caliber Air Rifle and Air Pistol Kit includes an military style air rifle and a military style air pistol that shoot 6mm caliber airsoft BBs up to 325 fps (rifle) or 325 fps (pistol). Both rifle and handgun feature a realistic look and feel. The Crosman Elite airsoft kit also includes a pistol holster and grenade loader with 800 rounds of ammo. Don't forget to grab some extra Airsoft BBs! (L x W x H) 19.63" x 13.00" x 3.25"